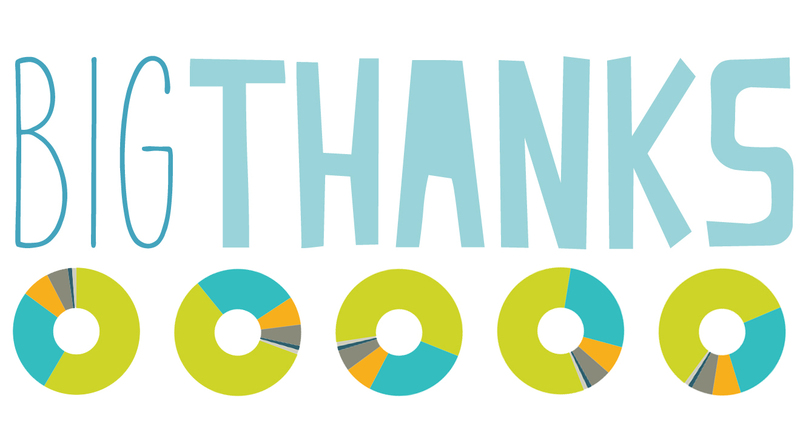 Thank you again to those of you who took the time a few weeks ago to participate in my reader survey. There were close to 2700 responses and I appreciated the kind words, the support and the constructive criticism/suggestions/requests. One of the big reasons I wanted to do a survey (my first one for this site) was simply to see if we were all on the same page. You guys are a great community and I liked the opportunity to connect with you in this way and get your input and feedback. Primarily I was interested in learning what's working for you at the same time I figure out what's working for me professionally and personally. I was also interested in some pretty basic information like how long people have been reading and how you access my content. 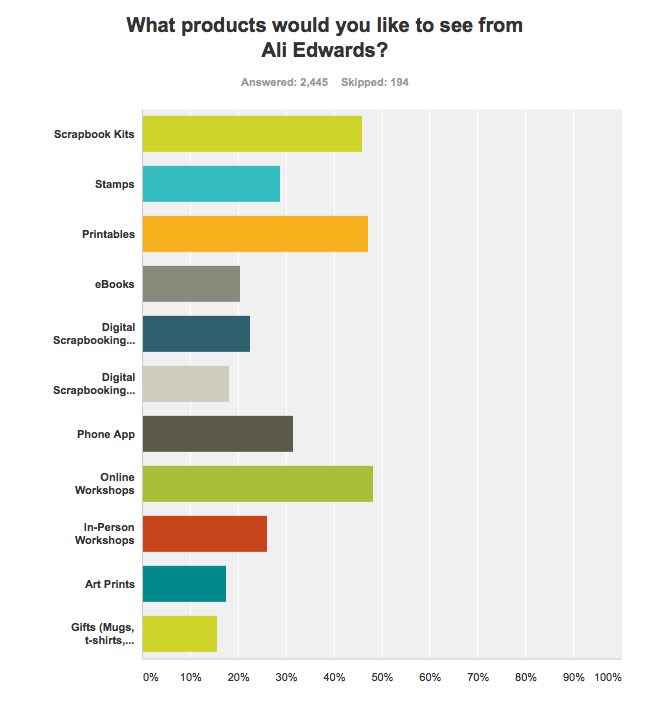 In case you were wondering I used Survey Monkey to create this survey and have exported the results graphs to share them with you today. So many of you have been around such a long time! Your continued support and loyalty is really humbling. 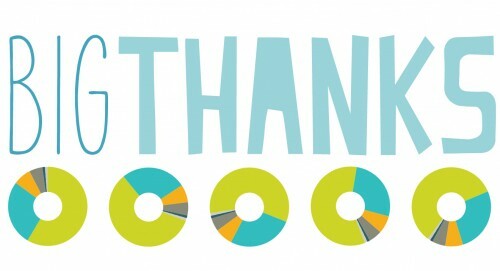 Thank you for being here and contributing to this adventure and being interested in my story and telling your own. This one was interesting to me as it's been a topic of conversation around here from time to time about how people actually read blogs these days. I've personally been going back and forth between Feedly and Bloglovin trying to decide which one I want to stick with regularly. If you want to subscribe via email go here. 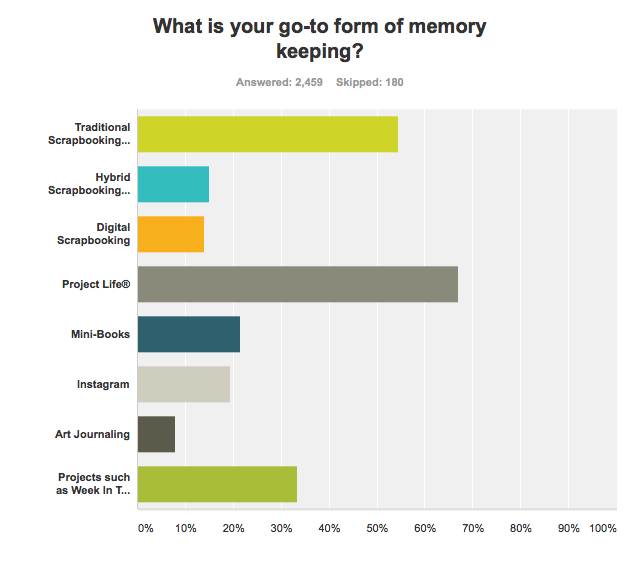 Not a huge surprise that Project Life® and traditional scrapbooking came out as the most popular forms of memory keeping. EDITED | I want to clarify that just because the majority of you responded that Project Life® is your go-to form of memory keeping it doesn't mean that my content is going to change to be solely Project Life®. It just gives me a good indication of what many of you are interested in right now and that helps me as I plan my own content. 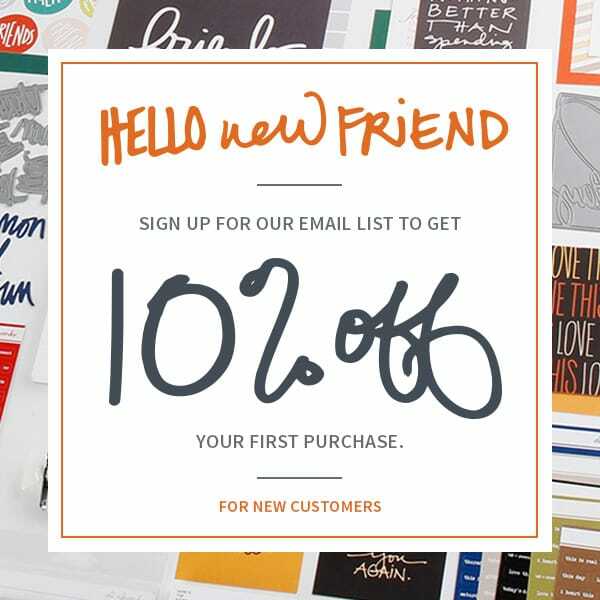 As many of you have noticed I've been doing more traditional layouts recently and I plan to continue that trend in addition to providing inspiration for Project Life® and other memory keeping projects. Personal stories and organization. Noted. I'm listening and I'm making some changes and adjustments to find ways to bring you more of what you want and less of what you don't. Obviously some of what happens here has to be commercial in nature as it's one of the ways I put food on our table, but I agree that there's an opportunity for a more intentional approach. Creating workshops is one of the things I enjoy most about my work. 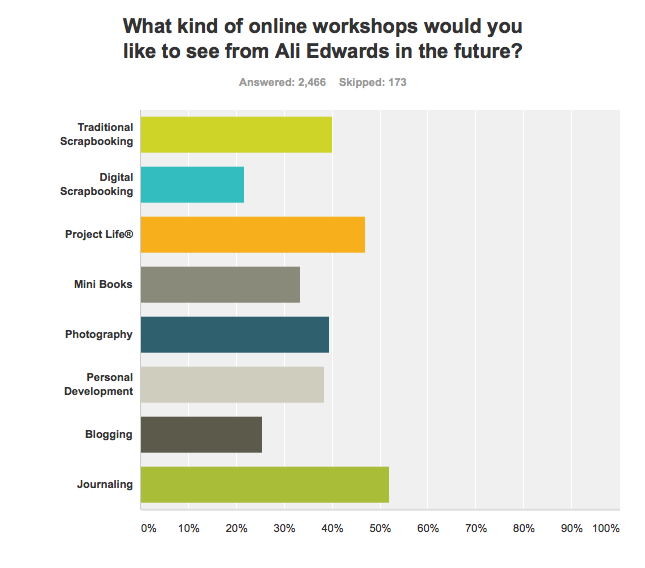 Thank you for the great feedback regarding workshops - this helps me as I plan what to focus on for the future. This was defintely helpful for me for planning what I'd like to focus on next. Again, thank you. 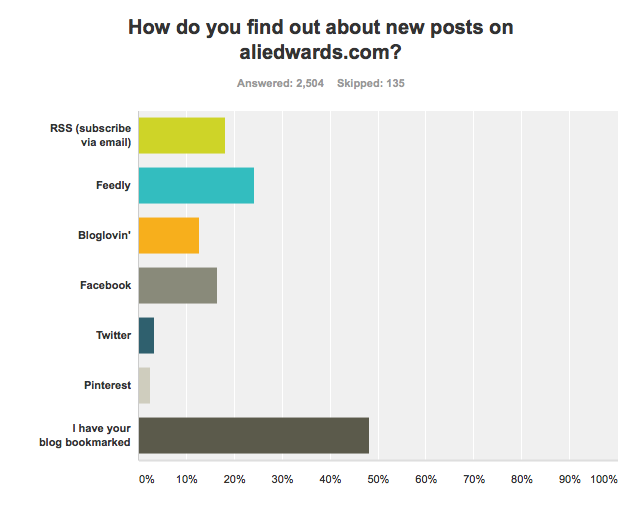 Why do you continue to visit aliedwards.com? "After following you for so long it has become "habit" (in a good, positive, way) I love what you write, love your insight into this crazy journey we are all on called life." "There's always something I can relate to or find helpful or inspirational... I like that you're not afraid to share personal stuff." "I discovered your blog at about the time you found out Simon was autistic. Not too long after I found out that my oldest daughter was also autistic. Your blog (in a way) helped me to find my way through the craziness that happened afterward. I felt connected to you, like I knew you and we had gone through something together. Since then I have loved how you keep your readers up on what's going on in your life but still keep it professional and with the spin of memory keeping." "I like your style of memory keeping..clean and not overly product driven. I like your style of blogging...real and inspiring. I admire your courage and strength. You are like a friend." "Because I like how you tell your stories and it helps me to remember to write things down and document everyday things, not just special ones. I also like your traditional scrapbook pages and try to follow your style in my own work. I also like to read personal stories about life with children, life after divorce etc. It gives me hope that even though that sometimes things are hard, if you work at things and keep an open mind and heart, your life can get better - it might be different to what you imagined but it will get better." "I randomly check in to see what is happening in the scrapbooking world." What is your biggest Memory Keeping Challenge? Time was by far the number one response. NOTE | Next time I do a survey I will definitely ask this one with suggested answers like the others to be able to have a graph that would map out the responses. I know I've said it a lot in this post but it's truly how I feel. There were an overflowing of really kind comments left throughout the survey and I'm grateful to those of you who took the time to communicate with me in this way. I'm also thankful to those of you who were honest about what you like/don't like. I'm not wrapped up in pleasing every single person - zero expectations for making that happen - but I do believe in being open to change and being able to take a good long look at the things I do/don't do on this site to make it even better for all of us. Thanks for taking the time to survey your readers, that says alot about you. I may be wrong, but I have this strange feeling that on the question where we were asked what we'd like to see less of, some may have answered for "more." The giveaways and the guest posts are always awesome!! Reason I say this is both my own personal opinion (lol) and also that so many people enter the giveaways and comment on the guest posts. I love that even when you are on vacation we sometimes get a fresh post, to me that is extra special. I'm sorry I didn't do the survey. Life was crazy during that time. 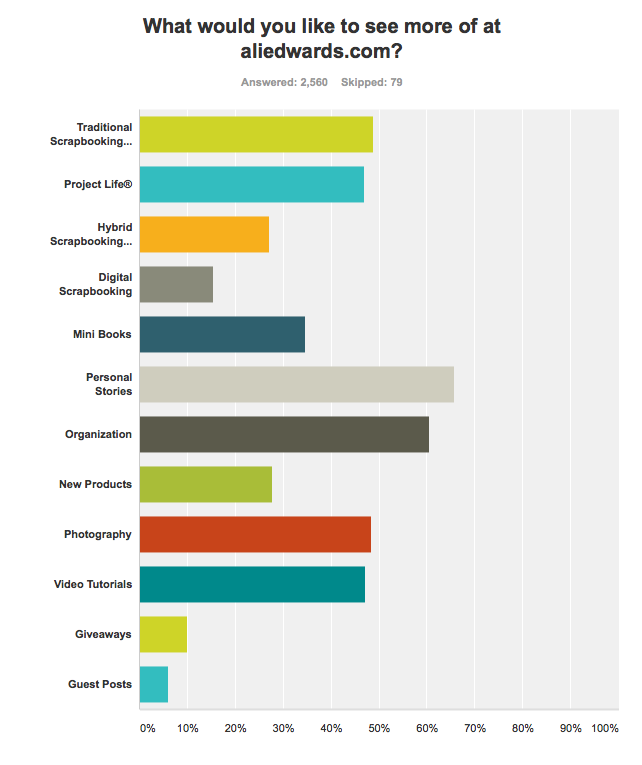 The results are very interesting, but somewhat surprising (& a little disheartening). First, I see way too much Project Life——everywhere, not just here. I like the way you've separated yours into a separate category. I've done it, liked it, but found it doesn't really work well for me. I like the aspect of documenting the everyday, but I found it too demanding (I know, I put the demands on myself). I journal daily, & I really like doing layouts that allow me to be creative. I've watched the trends & predict a return to more traditional/digital (I'm surprised the results for digi were so low). My fear is that traditional products will disappear——I've already found it difficult to acquire some things. I'm hybrid, loving both digital & traditional, & having been a digital design artist (also newspaper reporter & photographer). I especially love mini-books, which got low ratings. Video tutorials are great, but I live where we have only very limited & slow, unreliable internet service, making it very hard to view videos. I personally hope you won't make too many changes. I've been reading your blog since close to the beginning, I think, & I think there's a good mix & it's inspirational on many fronts. Keep it up! And——the thanks go to YOU, Ali! Don't be disheartened. Everyone gets to choose how they want to spend their memory keeping energy. 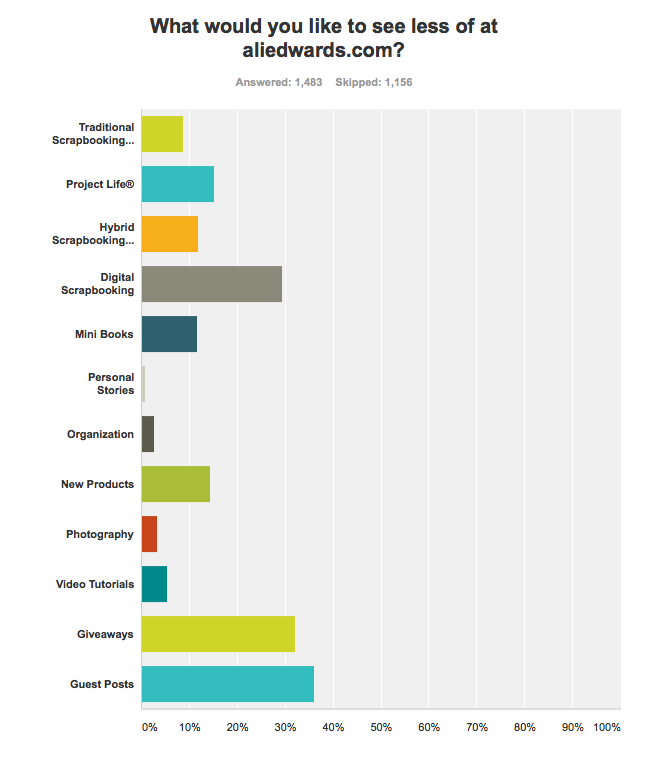 This was really more for my own information, to get a sense of what the active readers in my audience are doing when they have the time and their overall interests. 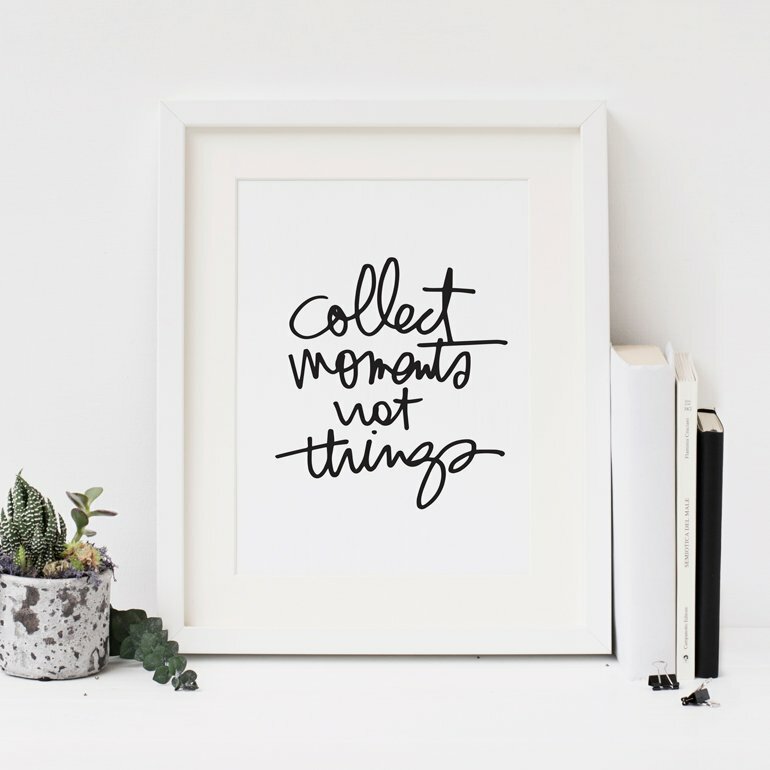 I don't think traditional products will disappear, there's definitely still a market for them and I'm definitely passionate about continuing to do traditional scrapbooking because I love it. Nothing drastic is happening here - just taking the general temperature. It's all good, Ali. Thanks for all you do (and have been doing for the past 7+ years) to keep my creative spark alive. You continue to inspire me. I am sorry I was unable to participate in the survey because I have read your blog and taken several of your online classes. Hands-down your blog is my favorite and first stop each day! Love your work, your authenticity and gracious professionalism. Thank you Ali. Thanks for sharing the results. Not really surprised by them. Just keep up the good work! I cannot remember if I did the survey or not. I have visited your signet what seems like forever...I know for sure about six years. Your December Daily album continues to be one of my all time favorite projects and with the craziness of life, if nothing else I get that accomplished every year. Thank you for introducing the concept. I found it interesting that personal stories ranked among what people want to see most. Sounds funny...almost stalking, but I have to admit that I agree to a certain extent. I love your take on things. It helps me think of how to document things in my own life and with my children. The way in words but also in photo perspective is inspiring. I remember when I discovered how to "warm up" pictures by adjusting the light settings on my computer...wow! It was after reading a Decenber daily post where you did the same thing. Now I adjust my settings all the time to improve my photos...thank you! Well, somehow I missed your survey; I must have been out of town. I've been following your blog since Simon was a little guy and clearly remember Ana's birth. I'm right in line with your survey, with the exception of hybrid layouts; I'd like to see more of these. You're one awesome person! I am so happy your survey came out on a positive note for you! You are fantastic at telling your stories and I really enjoy following your blog everyday. You make me stop and realize that its not only about the photos, but the stories that go along with them. Thanks Ali! I missed the opportunity I think to participate in your survey. it would have been great. the one area I need help with is remembering to take a picture. I approach memory keeping as a writer so I don't have a problem coming up with words. when I'm capturing a memory my first thought is to write it down. when a lot of times a photo would capture it perfectly. so any help on remembering/reminding/prompting myself to snap the photo first then write later would be of great help. I too would be concerned if content was overly PL. While I use PL and love Becky for introducing this to the masses, I still think you were one of the more innovative traditional scrapbookers who was using divided page protectors or making your own tall skinny with sewing even way back when in a combination with regular 12x12. Being one of the trend setters of not only mixing up page sizes but also giving people beautiful, yet clean/simple layouts they felt they could do. I would guess there are people like me who don't follow the PL concept exactly but use the products to speed up having a meaningful album for the year. The fact is though it's only through manageable workshops that I've had a desire to purchase new product and actually sit down to get things created. I'm not surprised by the lack of digital interest. When I create there is something really cool and different about tangible work rather than staring at a screen or hunting endless files to try to find something of interest to use. Maybe even mini-workshop of "new uses/reasons for digging through your digital files" - topics like it's okay to delete digital items, ways to insert digital content into mainstream easy programs like Word/pages/iphoto, printing tips for printables, etc. Anyway, just my thoughts after reading this post. Keep up the amazing work Ali! Just wanted to say thanks for putting up the results. I took your survey and was very interested to hear the final results. I fall into the category that has followed you on and off for 6+ years and I visit your blog almost everyday. I started out scrapbooking when we only had Creative Memories, I've done digital and hybrid and now I'm more PL. Everybody has a style and a preference. That's what makes us all so unique. We can move back and forth between any and all methods at any time. We can mix it all in together in one book. There are no rules. It's so nice to see your posts because I never know what to expect and I'm always inspired and challenged. Your classes definitely make me reach inside and often step outside of my comfort zone which equals growth. You make me want to do it all. Just keep being you and doing what you do. Go Ali! Thanks for sharing Ali! Honestly I feel like you are friends with us readers, by what you share here. Ali, thanks for sharing. You build community with this little action. so much fun to see those answers. I'm always interested in what others thought about your blog. I hope the results regarding digital scrapbooking won't cause you to reduce your creating digital products. Between you and Cathy Z (and a couple others), you supply me well - and I use the products regularly. No intention to decrease the quantity ;). I wish I had done the survey. You are definitely an inspiration...in many aspects of my life. Reading your blog feels like I'm reading about what a friend is doing. I hope that doesn't sound weird, but knowing what you've been through with your divorce somehow makes me feel connected to you in that way. It's a difficult loss to go through and knowing someone has made it through as well as you have inspires me to stay positive. thank you Ali for your imagination, your creativity & your kindness. Thank you for being like a friend who shares her life with us. I agree that many people must love the give-a-ways because so many people enter them. Thanks for posting the results. I'm glad I got a chance to participate in the survey. As someone who uses both traditional & PL forms of memory keeping, I was impressed that so many are interested in traditional scrapbooking. I really do like mini albums too and was surprised this format scored so low. It is interesting reading everyone's comments. I'm just happy so many people love this craft. So many of the small stores are going out of business, that it's nice to see a group of passionate paper crafters! Keep up the good work! I'm inspired by you everyday! I missed the survey. My day job often turns into homework. Don't know how many years ago I started reading your blog but I was hooked immediately. Watching Simon grow and mature and the addition of Anna has been wonderful. Your documentation of every day life is honest and simple. I love that. I haven't done that much scrapbook ing but still read your blog regularly. Thank you for being real, Ali, and allowing so many to be real along with you!